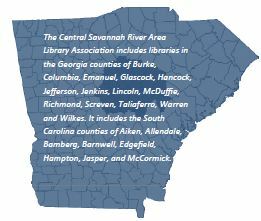 The Central Savannah River Area Library Association includes libraries in the Georgia counties of Burke, Columbia, Emanuel, Glascock, Hancock, Jefferson, Jenkins, Lincoln, McDuffie, Richmond, Screven, Taliaferro, Warren and Wilkes. It includes the South Carolina counties of Aiken, Allendale, Bamberg, Barnwell, Edgefield, Hampton, Jasper, and McCormick. The largest city in the area is Augusta, GA.
Members of the association consist of librarians and paraprofessionals from public libraries, school media centers, special libraries, and university and college libraries. The objectives of this Association are to encourage and promote the utilization of knowledge through the collection, organization and dissemination of information; to enhance usefulness and efficiency of libraries in the CSRA; to promote high professional standards; to facilitate communication among its members; and to cooperate with organizations which have similar or allied interests.